Defending champions City of Glasgow College stormed the kitchen to retain their title at the Country Range Student Chef Challenge. The Scottish students were triumphant on home soil as they kept an iron grip on their crown at the competition’s final held during ScotHot at SEC Glasgow. The competition, which pits teams of college students from across the UK against each other, saw young chefs Alan Coats, Ance Kristone and Andreau Talla take the title – finishing ahead of Loughborough College and Carlisle College in second and third place respectively. Studied under the watchful gaze of Craft Guild of Chefs judges, the victorious Glasgow team pipped the competition thanks to their supreme skill and precision, as well as high-quality flavour and presentation. “As we expected from the final, there was a fantastic array of skills on show, from traditional and classic cooking methods to newer techniques and ingredients,” said Craft Guild of Chefs’ Chairman of Judges, Chris Basten. The winning trio won a day’s work experience at a Michelin-starred restaurant and a foodie tour in London. And the winners will hope to follow in the footsteps of some prestigious former champions, who have gone to earn top jobs in the industry following success throughout the competition’s 25-year history. Country Range Marketing Manager Emma Holden, who organises the challenge, said: “All the teams who made the final can be incredibly proud of themselves as, from today’s evidence, the UK’s professional kitchens are in safe hands. 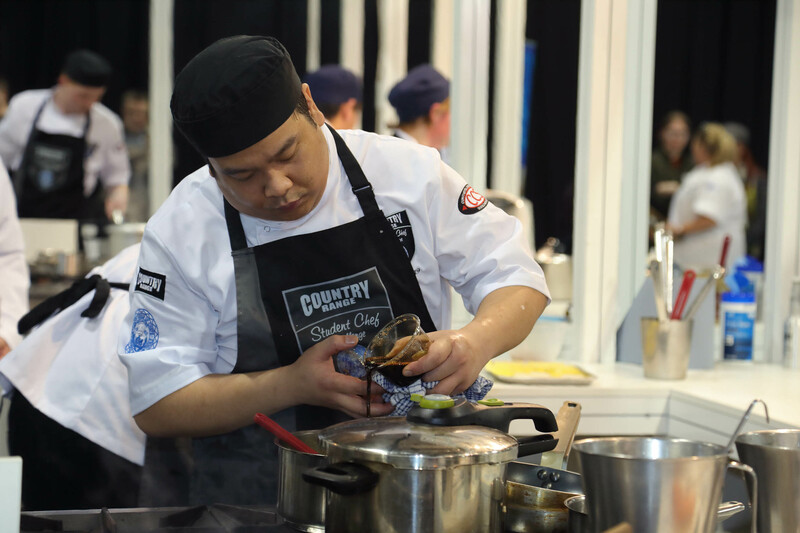 Read April’s edition of Wholesale News to check out our behind-the-scenes feature on the Country Range Student Chef Challenge. Originally published 9:59am March 22, 2019 , updated 5:03pm March 26, 2019 .